What a scorcher! The first real taste of summer weather and the gardens seem to be swelling with the joy of it all. 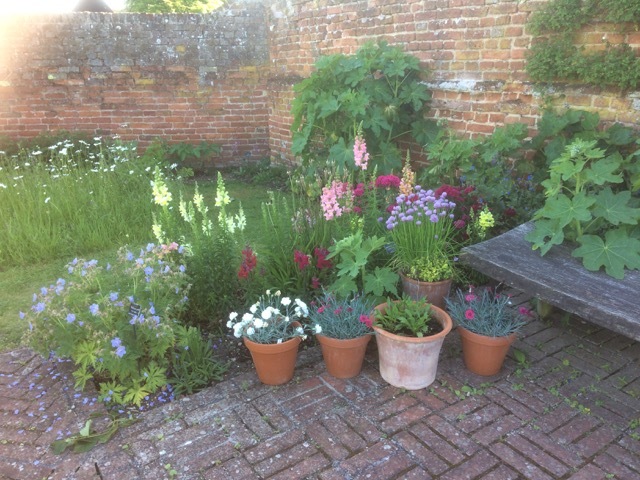 The end of May and beginning of June have got to be about the best weeks of the gardening year. The growth is lush and healthy, flower buds are bursting out everywhere and nothing has yet ‘gone over’ or flopped. If you only visit Cressing gardens once in the year, make it now, for its best moment is just about upon us. 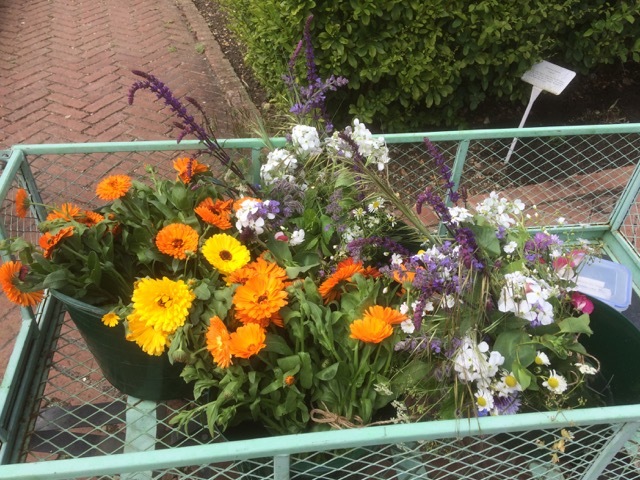 Our own cut flowers, grown in the community garden, have been available for the first time this week, and very tempting they look too. 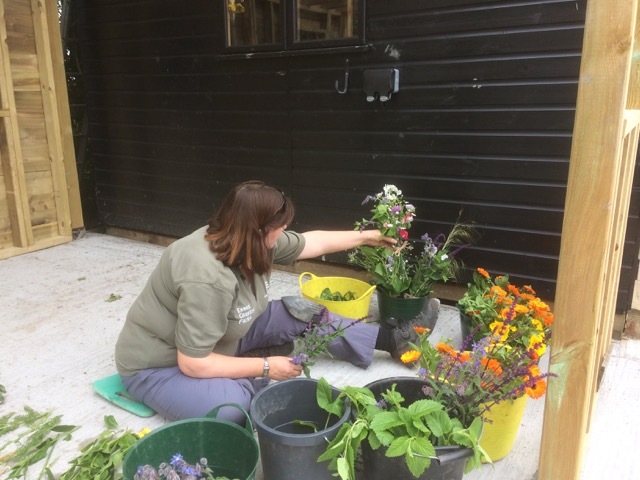 Alison put her artistic flair to good use making up bunches on Tuesday, adding a new and colourful dimension to our plant sales area. What a colourful splash. Tuesday would be a good day to come along if you fancy some country garden style flowers and they are selling at £1.50 a bunch. 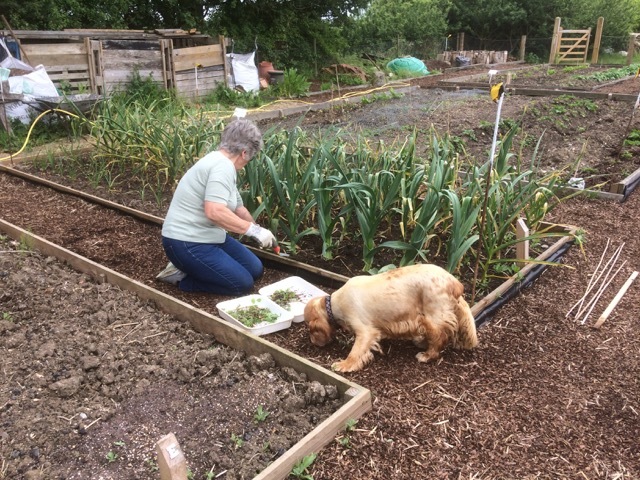 Despite the heat, work has continued as usual this week, with plenty to do in the walled garden and on the veg plot. 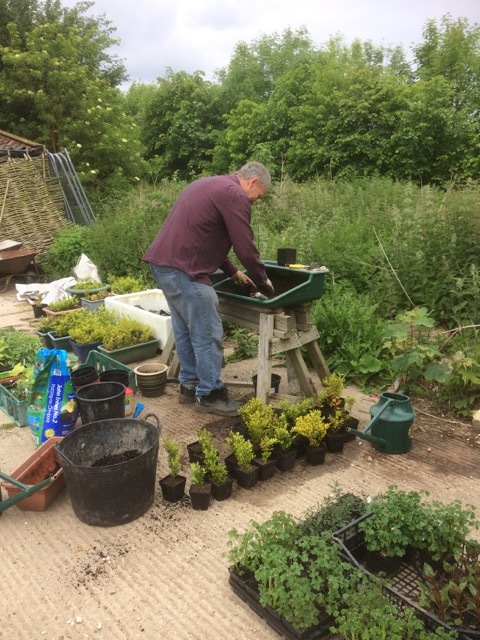 We were kindly donated a large number of dwarf box plants which Andy was busy potting up for sale. They would make a perfect low hedge or you could try your hand at clipping a bit of topiary. They are well rooted, good sized plants. Let me know if you are interested. Getting on top of the spring flush of weeds was a priority in the veg garden. Nellie didn’t seem very impressed with the offer of salad – where’s the real grub? 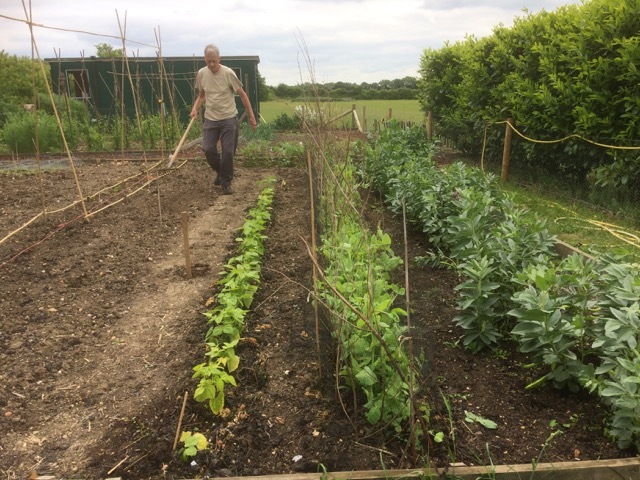 We will have our first harvest of veg very soon, including broad beans, onions, peas and garlic. Beans and courgette, tomatoes and peppers, sweetcorn and summer squash – just some of the delights to come. I can hardly wait. In the walled garden I decided to keep cool by taking a dip in the pond! 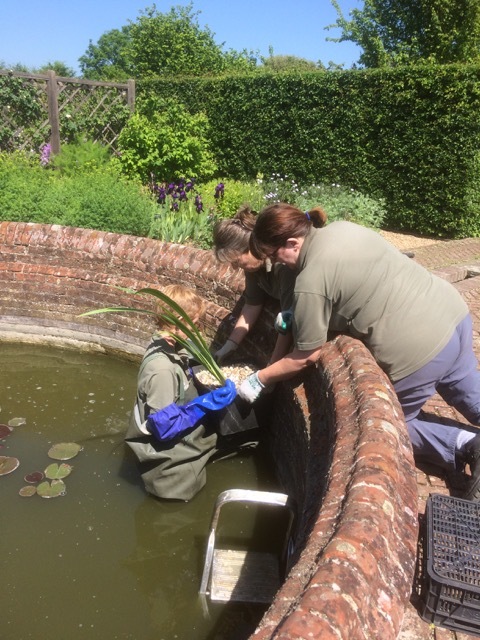 We are trying an experimental planting of the native yellow flag iris (Iris pseudocorus) which we have put in a large pond basket. It is very vigorous so we will need to lift it regularly to divide it but, if happy, it will provide a lovely show and add extra interest for wildlife in our pond. 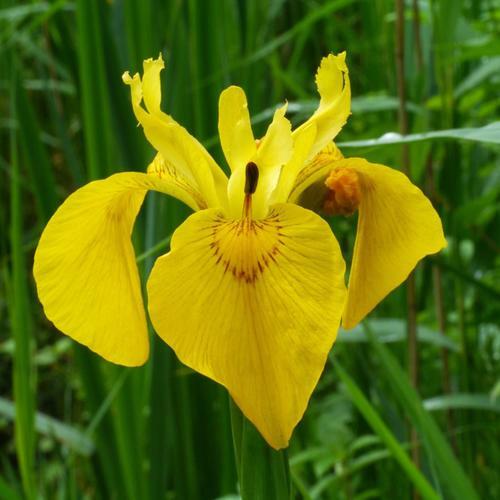 The plant below is only ever commented upon when it does this – puts up spikes of dramatic yellow, star shaped flowers. It is called King’s Spear or Asphodeline lutea and what a dramatic sight it is at the moment. 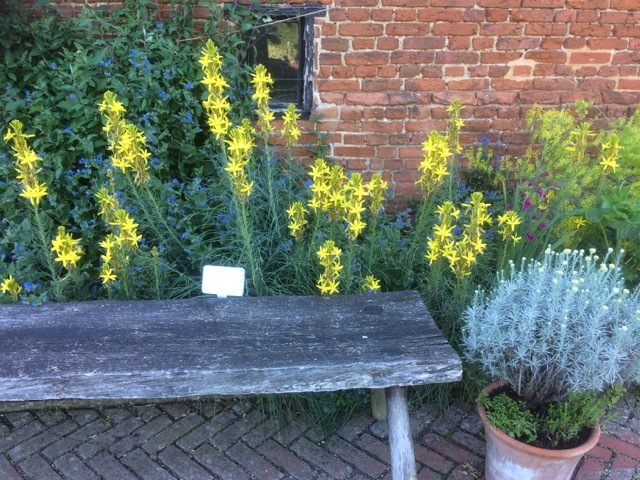 Introduced from Italy in 1506, Turner speaks of the asphodel in 1551 as a rarity, and it is still uncommon in our gardens. Prepared in various ways, they were used as food by the Greeks and in the Middle Ages were held in high esteem, and called Cibo Regia, food for a king. 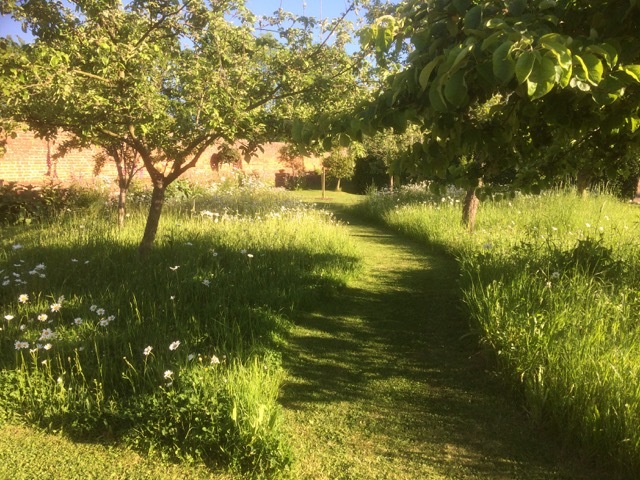 The areas of long grass with short mown paths meandering through the walled garden orchard are a lovely sight at this time of year and will look even prettier in a few days time when the majority of oxeye daisies (Leucanthemum vulgare) are in full bloom. The first of our garden weddings this year is on 10th June and I will be cutting the grass short to allow for the wedding guests to be seated. So, if you want to see it like this, visit soon! 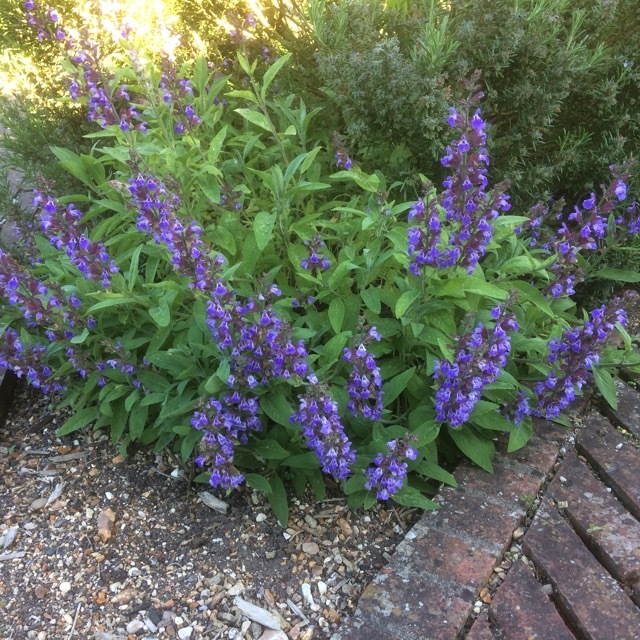 Do you have sage flowering in your garden? It does look a glorious sight when in full bloom like this one in the forecourt garden. People often ask why their sage doesn’t flower. The purple and variegated ones never seem to but the plain leaved varieties flower beautifully, grown with maximum heat and good drainage. If you keep pinching out the tips for cooking you will stop it flowering and get better leaf growth. Sages are short lived plants and best replaced after about 5 years. They are easy to grow from cuttings and we always have young vigorous ones for sale through the summer, so if yours is looking long and lanky why not start again with a new one? 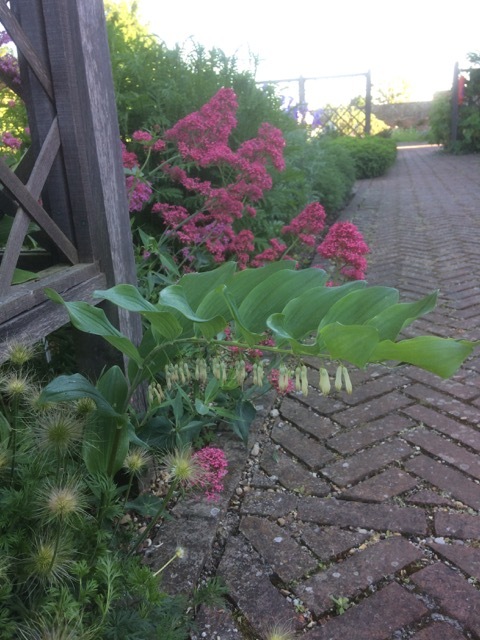 The intriguing plant below is called Solomon’s seal (Polygonatum x hybridum), the flowers dangling below the leaves like pairs of ballet slippers. Also called David’s Harp or Ladder to Heaven, this species is indigenous to Britain. John Gerard was very enthusiastic about its ability to heal broken bones and goes on to advise that the fresh green root, when applied, ‘taketh away in one night or two at the most, any bruise, black or blue spots gotten by falls or women’s wilfulness, in stumbling upon their hastie husband’s fists, or such like.’ Hopefully I won’t be needing that! Our three bee colonies are doing extremely well and stores of honey are building up nicely. Jan and I inspected them on Wednesday. The first hive had one super full of honey and lots of signs of breeding in the brood box. Lovely gentle bees. In the second hive we didn’t spot the queen and there were a few queen cells. We left one sealed in case a new queen is needed. The third hive has a very strong colony and there were swarm cells developing. We didn’t see the queen but with so many bees it’s hardly surprising. We are in the process of buying our own honey extractor. I will let you know as soon as Cressing honey is available. In the meantime we have Jan’s honey from their Great Leighs beehives for sale at £4 a jar. 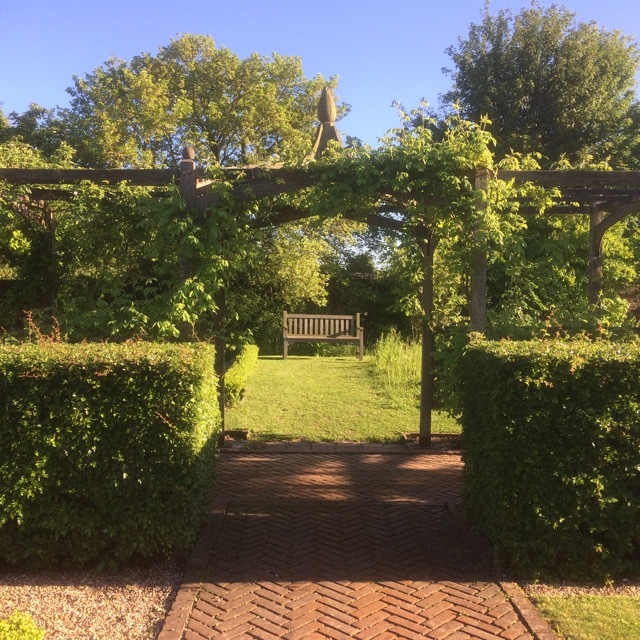 Enjoy your gardens this Bank Holiday weekend or pay a visit to Cressing and linger on a bench to soak up the sun.